Research in the Franco lab focuses on theory and computation as applies to dynamical processes occurring at the nanoscale. In particular, the lab uses and develops theoretical techniques that allow the identification of new methods to exert control over the behavior of matter by means of external stimuli, a topic that the group likes to refer to as “Molecules under Stress”. Problems that are currently of interest in the group include: 1. Laser control of electronic properties and dynamics; 2. Electronic decoherence in molecules; 3. Theory and simulation of single-molecule pulling processes; 4. Novel spectroscopies and control in single-molecule junctions. I. Franco, A. Rubio and P. Brumer. "Long-lived oscillatory incoherent electron dynamics in molecules: trans-polyacetylene oligomers," New J. Phys. 2013, 15, 043004. M. MuCullagh, I. Franco, M.A. Ratner and G. C. Schatz. "Defects in DNA: Lessons from Molecular Motor Design," J. Phys. Chem. Lett. 2012, 3, 689-693. I. Franco, C.B. George, G.C. Solomon, G.C. Schatz and M.A. Ratner. 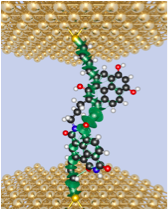 “Mechanically activated molecular switch through single-molecule pulling,” J. Am. Chem. Soc. 2011, 133, 2242-2249. I. Franco, M. Spanner and P. Brumer. “Quantum interferences and their classical limit in laser-driven coherent control scenarios,” Chem. Phys. 2010, 370, 143-150. I. Franco, M. Shapiro and P. Brumer. “Femtosecond dynamics and laser control of charge transport in trans-polyacetylene,” J. Chem. Phys. 2008, 128, 244905. I. Franco and P. Brumer. “Minimum requirements for laser-induced symmetry breaking in quantum and classical mechanics,” J. Phys. B 2008, 41, 074003. I. Franco, M. Shapiro and P. Brumer. “Robust ultrafast current in molecular wires through Stark shifts,” Phys. Rev. Lett. 2007, 99, 126802. I. Franco and P. Brumer. “Laser-induced spatial symmetry breaking in quantum and classical mechanics,” Phys. Rev. Lett. 2006, 97, 040402 (2006). A summary of the Franco Group research can be found below. The way that we traditionally use external stimuli is as observational tools that offer insights into the workings of the molecular world. In fact, most of the things we know about molecules we have learned by determining the way that they respond to chemical, electromagnetic or mechanical perturbations. The interest in our group is in exploring, using theoretical tools, an additional facet of the molecular response to external stimuli: its use as an active control tool to manipulate the properties and dynamics of matter in intriguing and potentially useful ways. In order to explore this venue of control, we use theoretical models and numerical simulations of the quantum-classical or fully quantum dynamics of nanoscale systems under the influence of external stimuli as means to identify possible mechanisms for control and to quantify the extent of control that can be achieved. sandwiched between two electrodes. Emerging experimental technologies permit the application of forces and voltages simultaneously, allowing for molecular imaging with atomic resolution, control of molecular conformation on a sub-Angstrom scale and probing the ability of molecules to act as a conducting medium as they are mechanically elongated. 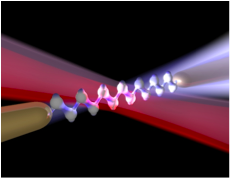 Our interest in this area is to explore the extent in which the simultaneous application of forces and voltages on single molecules can be used as a powerful avenue for molecular control and as a way to construct novel highly discriminating multidimensional spectroscopies that offer detailed information about molecules in junctions. Such an objective requires extensive theoretical modeling that helps understand and extract information from current single-molecule measurements and guide future experimental developments.